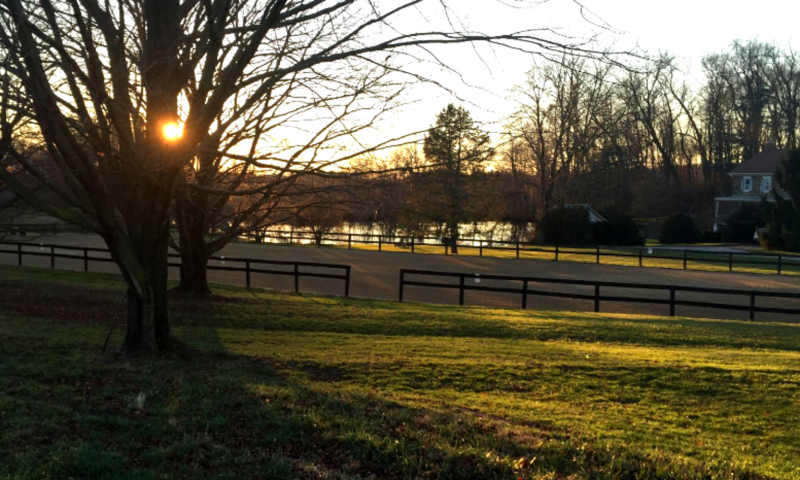 Ships Quarters Farm is situated on 85 acres in beautiful Carroll County, Maryland surrounded by agricultural lands. Convenient to major routes for access to outside events, yet tucked in a private location to give you the feeling of being away from it all. The main barns consist of two barns located in close proximity to one another. They are open designed barns with each horse’s stall open to the outside and safety windows or additional openings in the back to open/shut for ventilation. This provides a healthier environment for the horses, with adequate air circulation during all seasons. The stalls are separate from the nearby Indoor Arena, giving the horses a mental break from the stimulation of noise and activity. Each stall has stall guards and dutch doors. The “courtyard barn” is shaped like a U with 12 stalls, and the “silo barn” has 11 stalls in a row. The stalls in both barns are matted and bedded with sawdust and range from the large sizes of 12’x13′ to 12’x15′. Both barns have fly systems installed and grooming areas for maximum comfort to both horse and owner at all times of the year. You will quickly get spoiled by the amenities open to all boarders! A heated tack room, wash stall with hot & cold water and heat lamps, a cozy kitchen with a fridge and a microwave, a bathroom with a shower and washer & dryer usage. There are 4 riding rings available at Ship’s Quarters Farm, including a 66’x132′ indoor arena with lights, windows, skylights and mirrors which is located by the barns for easy access during bad weather. The footing is a mixture of sand, rubber and fabric coated with a polymer resin to prevent dust. This mixture is easy on the horses joints and lungs. There is also an outdoor full-size dressage court with sand footing. It is the perfect place for schooling and practicing dressage tests. 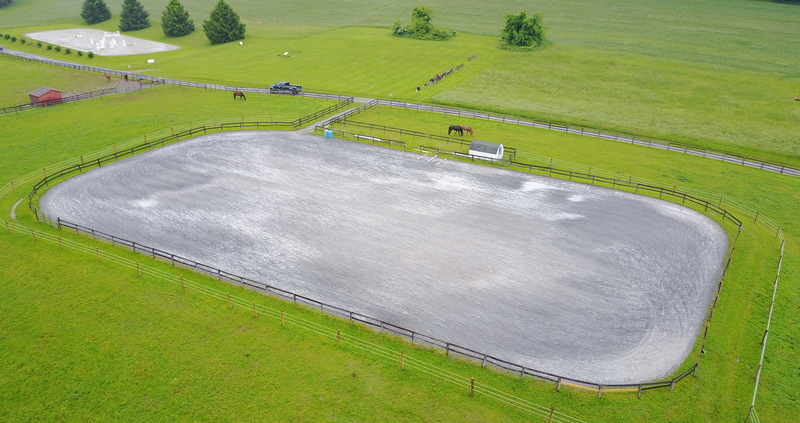 A large jumping ring (130’x300′) with sand footing is available for jumping or schooling. There is also a “quiet lower ring” that is located away from the distraction of the barn activities, lessons, shows, or clinics. It is a full size ring (66×198) and has a yellow sand footing and a fenced perimeter. The 4 rings available at Ships Quarters Farm allow both horse and rider to experience a variety of footings and settings with out ever leaving home. There is a “conditioning” field for terrain work, trot or canter sets, also to hack in or take lessons in! Ship’s Quarters Farm is situated in the heart of Hunt Country and there is access on and off the farm. The Carrollton Hounds hunt in the surrounding area and leave from the farm several times a year. Most trails are on the edges of fields and follow in and out of lightly wooded areas. The terrain is welcoming over gradual hills with an occasional cross country jump. Boarders enjoy these trails together or solo, to warm-up or cool-down their horses, or to have a relaxing hack during a hardworking schedule. With access to so many varied riding opportunities and 85 acres, it’s never too crowded! The pastures at Ship’s Quarters Farm are plentiful. There are larger ones for small group turnout and smaller ones for individualized or special turn out. All fields are fenced with sturdy 3-board fence and in some places with electric braid. The fields are double fenced so that the horses can not play over the fences reducing the risk of injury.